How to connect with customers cheaply and efficiently... right now! If I had to venture a guess, I would say that the biggest single issue facing you, as a retailer, right now is “How do I make enough sales to stay in business and grow my business in this economy?” If I am close to the mark, this article is for you. First, a bit of background. Many of you who have been following this FURNITURE WORLD Magazine series know that I am a big proponent of finding less expensive ways to maximize the return you get on your marketing, PR and advertising dollars through the use of various social media tools. This article will take you into the platform that is the game changer for the whole world when it comes to reaching consumers most efficiently, effectively and exactly where they are at any given moment. That platform is MOBILE SOCIAL NETWORKING. You may barely have had time to think about, absorb and decide upon whether or not you even want to try to implement a social media strategy to get closer to consumers... but your customers are already there! Over 570 million people are using some form of social media platform to communicate with each other and with the brands they care about, and this number is growing exponentially. If you’re not there, you’re just not where your consumers are! If you think our industry is not using social media sites like Twitter, you are dead wrong. More than 500 retail furniture stores, plus big manufacturers, importers, interior designers, home stagers, green consumers, eco-moms, editors and suppliers follow my “tweets” on Twitter (@tkpleslie). There are 3000 people who’ve signed up to receive my messages, and I am just getting started! This is real influence that can be gained for free by anyone in our industry who has a strategy and is willing to invest some time. This is viral marketing at its best, which means that even a small number of the right “followers” can influence many thousands in a short period of time. It is very powerful-and, did I say, FREE? Now let’s look at what will almost certainly be the next frontier for your business’ growth: MOBILE social media networking. The following data was supplied by Tomi T. Ahonen,one of the world’s leading consultants in the mobile space and the go to “aggregator” for statistics about the mobile telecom industry. He is based out of Hong Kong and has been exceedingly generous in agreeing to share his information with FURNITURE WORLD readers. Now, as they say on NPR’s Marketplace, “let’s take a look at the numbers”. They are mind boggling. Daily circulation of newspapers: 480 million. Cable/satellite TV subscriptions: 850 million (TV sets overall: 1.5 billion). PC’s in use including laptops: 1.0 billion. Mobile phones: 4.0 billion- yes, 4.0 BILLION. And here is another unbelievable statistic. 30% of the mobile population have two or more subscriptions. More than a BILLION new mobile phones are sold every year, compared with about 200 million new TV sets and 300 million new PC’s. Now: how are people communicating via mobile? SMS Text Messaging: it is the single most widely used data application on the planet. There are 3 billion active users of text messaging. That’s 76% of all mobile phone subscribers. Compare this to 600 million users of instant messaging and 1.3 billion active users of email. Retailers like Ashley Home Stores have already had some success using text messaging. 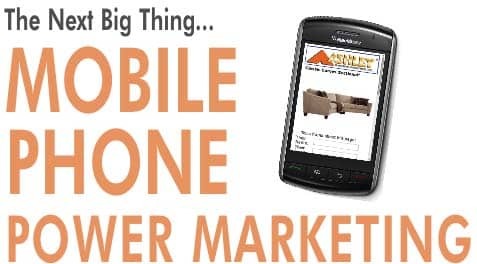 Charlie Malouf, Managing Partner & COO, Ashley Furniture HomeStores with 10 locations in North and South Carolina said, “We sent out our first SMS Text Message offer in June with a one day offer (Great 12 Event - 12% Off - 12 Hours Only - 12 Months No Payments). That message actually drove in some business for us and gave us a little bit of confidence in this medium. “Then, in July, we sent out a Secret Sale offer via Text that had a very good ROI for us. It was a 15% off all furniture offer, plus 25% off all mattresses & accessories. We had a 0.87% response rate from the text message offer that was just 140 characters and generated $85,000 in sales from these customers who purchased because of the text. “We had some interesting stories too, such as a customer who was in a competitor's store when she received her text message and then called her husband to go to Ashley and check out what we had. That couple ended up purchasing several thousand dollars from us and not from the competitor. Paste the following url into your browser (http://bit.ly/lHr9O) to read about how surprised Ashley was with the actual sales results it achieved with its text messaging only ad campaign. To continue, 1.35 billion people are active users of picture messaging globally which is more than all active users of email and, 1.05 billion mobile phone users are active users of the mobile WEB, using their phones to browse websites, which is more than all PC owners combined. Most important to our industry is this stat: 400 million internet users access the internet today EXCLUSIVELY through mobile which means 29% of the world’s internet access is exclusively from mobile, 25% is exclusively from a PC and 46% of internet users access from both a mobile and a PC. The opportunity this represents for each of you to reach your new customers extremely inexpensively through ads, text messaging, emailing and social networking on mobile platforms is, clearly, immense. At this point, you may be saying to yourself, “OK, these stats ARE amazing, but I just sell in the US and only in my local market.” What then? Here are US stats: According to a May 2008 report published by Nielsen, in the US, the mobile web has become a mass medium. There were 40 million active users based on past 30-day usage. This is just a subset of the 95 million US mobile web users who subscribed to web-enabled services but didn’t, as of one year ago, use the web on their phones. Understand that this is just a small subset of the 254 million total US mobile (web and non web) subscribers. One year ago, only 15.6% were actively accessing the web with their phones, but the growth curve is steep, and between the first quarter of 2007 and the first quarter of 2008, the number of monthly users of the MOBILE WEB increased by 73%. What is most interesting, though, is this: as of Q1 2008 (most recent info provided by Nielsen) the mobile internet penetration in the 16 countries they surveyed was only 15.6% in the US as compared, as we’ve seen, with over 100% for other countries (because users have more than one phone). This is the definition of a growth market! 27.4% of the US mobile internet users are between 25-34 years old. 34% are between 35-54 years old! And, surprisingly, 9.1% (a significant number and growing) are between 55-64 years old! This you may notice is the sweet spot for furniture marketers. Let’s imagine that you have a potential customer who is a super-busy multi-tasking working Mom. We will call her Mrs. Smith. She just got a text message from “Your Furniture Store” on her mobile phone telling her about a ONE DAY ONLY coupon good for 15% off whatever she buys if she mentions MOBILE when she comes in. She is out driving around when she receives this. Her husband has just finished playing golf. Her interior designer just got her nails done. Her 24 year old is just waking up. Her friends need to be rounded up to come with her to help her decide! She needs to get them all together now to meet her at “Your Furniture Store” so she can make a decision and just get it done! What does she do? She texts them all together using a service like www.tatango.com which offers group texting-at one time-for free. So how can you get started? 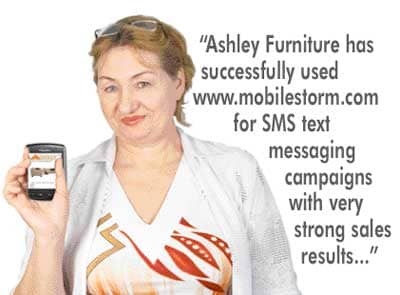 Charlie Malouf at Ashley Furniture has successfully used www.mobileStorm.com for SMS text messaging campaigns and gotten strong sales results. Based on his recommendation, (he can be reached onTwitter at @iPosit, his personal address. His corporate address is @ShopAshley) you may want to contact this service to get more information. I would be very interested in getting feedback From FURNITURE WORLD readers. And, if you use or know of other services where you have gotten a strong sales result from a text messaging campaign, please send that information to share with other retailers as well. Now, let’s say Mrs. Smith needs some information from her network about “Your Furniture Store” while she’s waiting at Starbucks for everyone to meet her or text her back. What does she do? She taps into Twitter or Facebook from her mobile phone and says, ”Hey, I am at “Your Furniture Store” waiting for my family to show up. Good or bad-what do U think?” Then, she waits for the replies to come in! Don’t believe that people will respond to this? You would be wrong. Try it yourself. It is amazing how many people DO respond. Really. So, with that information, maybe you can understand why, after text messaging, the fastest growing segment of the mobile web is social networking. At the recent World Mobile Telecom in Barcelona in February of 2009, the CEO of My Space announced the launch of a new My Space Mobile web site. They have had a 50% increase in mobile usage in the US over the past six months, an 80% increase in Europe, and a 60% increase in the Asian market with over 20 million users hitting their mobile site each month. By the way, Facebook is now nearly two times as large as MySpace and is on mobile as well. Many businesses are using it to connect with their businesses’ fans. 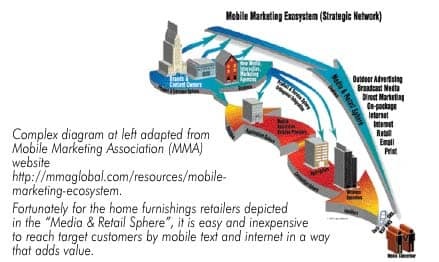 So what are the action steps you need to take if you want to explore the mobile web as a marketing vehicle for your furniture business? 1.Do real market research on your demographics and find out how many people in the markets you serve are using the mobile web. 3.Make sure you have a good website. What is good? Optimized for the search engines (SEO) and loaded with detailed product information, videos and solid educational content. If you need suggestions for companies to help you with this email leslie@furninfo.com or on Twitter @tkpleslie for suggestions. 4.Once these pieces are in place, use www.kwingo.net’s service. This application is a game changer as it allows the consumer to view your website on ANY web-enabled phone at the correct screen resolution for that phone. This is a huge issue for US mobile web users and kwingo has solved it. In addition, you can send consumers coupons straight from this application, set up a live Twitter feed, a live blog, and show them your entire product selection... all because they are really on your website via their mobile phones-in real time! I hope you understand how critical this is to your businesses. In addition, their service is inexpensive. Leslie Carothers is CEO of The Kaleidoscope Partnership- a social media agency for the home furnishings and related companies. Along with her COO and business partner, Sev Ritchie, they strategize, implement, execute and train companies how to use social media marketing to increase top line revenue and decrease bottom line expenses for increased profits. They are also international speakers on social media and other internet related tools home furnishings companies can use to grow their own businesses and brands in today’s connected economy. For more information visit http://tkpartnership.com or email her at leslie@furninfo.com.